Spring has sprung, there’s a warmth in the air, the evenings are lighter and the alfresco season has begun. Carluccio’s picnics bring a touch of Italian style to any outdoor event whether it’s a get-together in the park, an after-work do or a trip to an open-air concert. Each picnic is priced at £45 with a kid’s version at £10 and can be ordered as little as four-hours in advance – perfect for those typically British days when the weather turns in the blink of an eye. Let’s Feast Choose from the Classic or Vegetarian both featuring an antipasti selection, Ligurian focaccia bread; rosemary bruschetta topped with fresh ricotta, mint and pea shoots and panzanella salad with tomatoes, celery, peppers, basil and olives topped with crunchy ciabatta croutons. Follow with poached summer chicken coated with a vibrant lemon and herb crumb and served with couscous and seasonal leaves, or the veggie roasted peppers with spinach, baby plum tomatoes, ricotta and goat’s cheese. Sweet treats include apricot frangipan tarts along with fig, hazelnut and chocolate biscotti. Pick a chilled white, rosé or bottle of Santo Stefano prosecco from the Carluccio’s shop with prices starting from just £6.95 per bottle. Little Italians Even mini picnickers can embrace the Italian spirit this summer with Carluccio’s Children’s Picnic. Kids can enjoy tasty treats such as rustic bread sticks with provolone cheese; cucumber and carrot batons; and larger dishes of pollo Milanese and ditaloni pasta tubes with tomato and basil sauce. A cute bear brownie makes the perfect treat once all those veggies are finished! 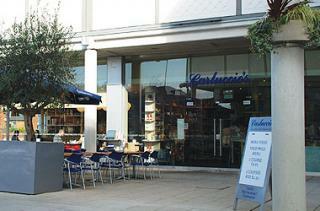 Order from your local Carluccio’s – then simply pop in, pick it up and head for your happy place. Hello summer!